A consent form is a patient form that includes statements patients read and a check box patients can select if they agree with the statements. You can customize and activate up to five consent forms per location in your organization. Three of the five are blank by default. Activating a form makes it available for all patients to complete online. Note: Each consent form, including its activation status, is location specific. On the a location's Patient Forms page, under Consent Forms, select a consent form (active or inactive). Form Expiration - Select how long after a patient completes this form that the form will expire and need to be completed again. English consent form title - Type a title for the English version of this consent form. 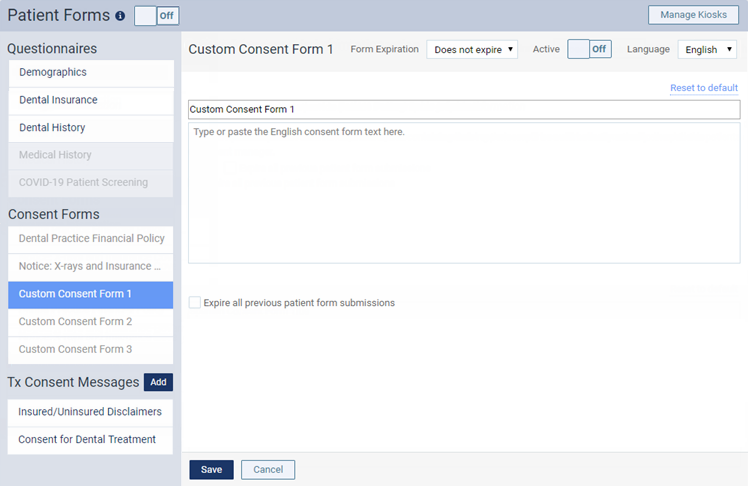 English consent form text - Type statements that you want patients to read for the English version of this consent form. The text must be at least 20 characters long and cannot be more than 100,000 characters long. When viewing the form online, patients will be provided with a check box to select if they agree. Spanish consent form title - If you want to make a Spanish version of this consent form available to Spanish-speaking patients, type a title for it. Spanish consent form text - If a Spanish title has been specified, the Spanish form text is required. Type statements that you want patients to read for the Spanish version of this consent form. The text must be at least 20 characters long (if a title is specified) and cannot be more than 100,000 characters long. When viewing the form online, patients will be provided with a check box to select if they agree. Patients whose records do not have Spanish as their preferred language will see the English version. Patients whose records have Spanish as their preferred language will see the Spanish version if the Spanish title and text have been specified; otherwise, they will see the English version. To return any field's text to the system default, click (or tap) the corresponding Reset to default link. If you want to make this form available to all patients, and the form is not already active, set the Active switch to On. Is the ability to add YES or NO check boxes to the custom patient/consent forms coming soon?